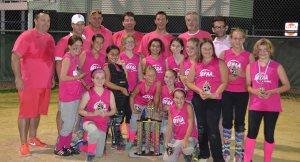 The Medford Tornados won the MYAA 4th/5th grade girls softball championship. The Tornados defeated Southampton Mustangs to capture the title. The Tornados outscored the Southampton Mustangs 21–14 in a high scoring affair on Monday, June 14, at the Hartford Softball Complex. “This team is a hard working special group of girls. They believed in themselves and remained positive the entire game and kept going out and taking care of business,” head coach Jason DeMarco said. The Medford Tornados came back from a three run deficit and scored 14 runs in the fourth inning to put the game away.